I love the way it makes my skin feel and its overall appearance and tone. I’ve used it a few times now and I feel it’s made a difference. I tried this sample for a week by using every night and loved the way it made my skin feel. Now a new essential part of my routine. I have not seen earth shattering results, used overnight, left on as per instructions. I did notice, however, that my skin feels nourished and moisturized, but visibly have not seen any changes to my skin. This is a great mask! Your skin will look firmer! It also reduces the appearance of fine lines and wrinkles! I like how hydrating this is and I will say a can see a very slight firming right after. It’s nothing crazy, but the extra hydration does seem to help. Not sure I would buy it again. This left my skin soft and refreshed. Not drying or caking like some detox masks. The fact that it is gentle enough to use regularly means I'll add it to my skincare regimen. I've used Cosmedix for years and wouldn't think of anything else. I have extremely sensitive skin and can use everything they have. Love this product! Absolutely LOVED it! Did it twice in one week before my wedding, slept in it both times and my skin looked and felt phenomenal in the morning. I love it.It helps my skin.It stops the dryness.My face feels fresh now!I can sleep better at night. 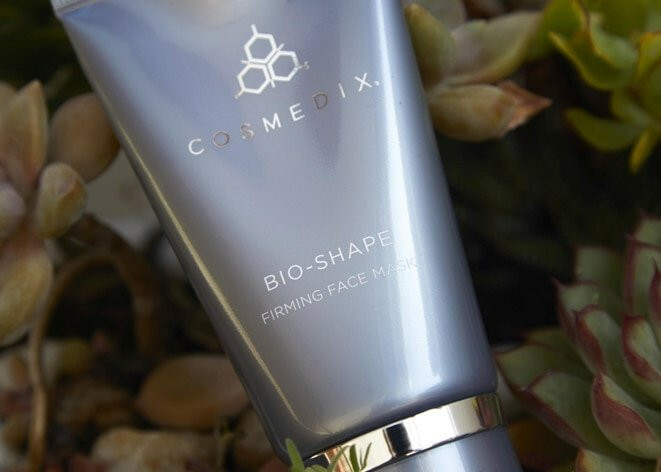 The Bio Shape Firming Mask helped diminish the appearance of my fine lines and wrinkles and helped make my skin look and feel tighter. I really like using this mask in my skincare routine. It is gentle and the results can be seen after using. My face looks younger and firmer with this mask. Great product to add to your nightly regimen. I have used this product for about a year now. I use it every other night. I can tell a difference in the tone and texture of my skin. It's a must! I love the way it smells and the texture is smooth and comfortable on my skin. it leaves my skin feeling smooth and soft. Feels amazing on your face! This face mask feels absolutely refreshing and had my skin feeling like a baby's - super soft and clear! I like that it didnt break me out like some masks have. it helped clear my face and helped it become healthy within a week. I like the feel of it. I've only been using it for two weeks. I leave it on while I sleep and in the morning my skin looks dewy, glowy and well rested. With most products you have to give it at least a month to see a more noticeable difference. So far I really like the product and on the days I don't put it on I use the Reboot overnight hydration complex which I really love!! Bio-Shape is amazing-it actually noticeably firmed my skin! I wake up looking refreshed and youthful! This product is remarkable!!! This product does exactly what you expect it to. My skin feels tight and firm the next morning. My skin looks so youthful after using this the night before. My face is so moist and much firmer with this mask. I love that it is a leave on mask and so easy to use. I’ve only used the Bio-Shape Firming Mask a couple of times so far but I’ve seen a difference in my aging (still oily) facial skin. Fine lines are less noticeable and even my rosacea is less pronounced. I like the way my skin feels after only a couple of uses. This product is a keeper. This is the best firming product I have ever tried, my face feels and looks firmer. I have been using this for almost a year and my skin looks amazing at 64 years old.